a. The two principal ground mounts used with the caliber .60 machinegun are the tripod mount, MS, and the antiaircraft mount, M68. The tripod mount, MS, is a ground mount designed for use against ground targets. The antiaircraft mount, M6S, is a ground mount principally designed for use against aerial targets. Its use against ground targets is limited because the mount tends to be unstable when the gun is flred at low angles. b. The three principal vehicular mounts used with the caliber .50 machinegun are the truck mount, M36; the pedestal truck mount, M81C and M24A2; and the commander's cupola, Ml 13 armored personnel carrier. a. General The M8 mount is the standard ground mount of the caliber .50 machinegun (fig 106). It is a folding tripod with three telescopic, tubular legs, connected at the tripod head. Each leg ends in a metal shoe, which can be stamped into the ground for greater stability. The two trail legs are joined together by the traversing bar. The traversing bar serves as a support for the traversing and elevating mechanism, which in turn supports the rear of the gun. The tripod head furnishes a front support for the mounted gun which is further supported by the short front leg. 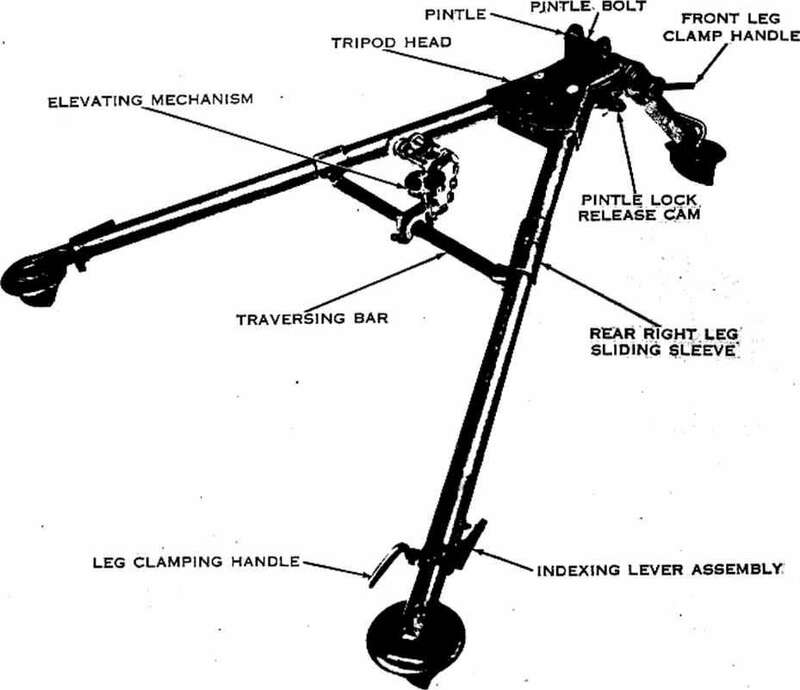 When the tripoid is emplaced on flat terrain, with all extensions closed, the adjustable front leg should form an angle of about 60 degrees with the ground. This places the gun on a low mount, about 12 inches above the ground. To raise the tripod farther off the ground, extend the telescopic front and trail legs (enough to keep the tripod level and maintain the stability of the mount). (1) Front leg. To adjust the front leg, turn the front leg clamp screw handle counterclockwise to loosen the front leg clamp screwnut. Adjust the leg to the desired angle, and tighten the front leg clamp. (2) Leg extensions. To extend any of the tripod legs, unscrew the leg clamping handle; press down on the indexing lever, and extend the leg to the desired length. Aline the stud on the indexing lever with one of the holes in the tripod leg extension. Release pressure on the indexing lever, allowing the stud to At the desired hole. Tighten the leg clamping handle. 6. Traversing and Elevating Mechanism. (a) Consists of a traversing bar, slide, and screw assembly. The traversing bar, graduated in 5-mil increments, fits between the trail legs of the tripod. The traversing slide and screw assembly are clamped in place on the traversing bar by the traversing slide lock lever. When the traversing slide is locked to the traversing bar, the traversing hand wheel should be centered. The traversing slide is properly mounted when the lock lever is to the rear and the traversing handwheel is positioned to the left. (&) To make changes in direction, loosen the traversing slide lock lever and move the slide along the traversing bar. This permits traverse of 400 mils left or right of the zero index in the center of the traversing bar. Readings on the traversing bar are taken from the left side of the traversing slide. For changes of 50 mils or less In deflection, turn the traversing handwheel of the screw assembly. 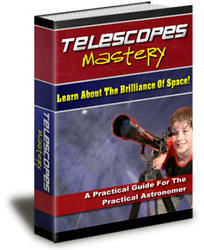 This allows a traverse of 50 mils left or right of center. One click in the traversing handwheel signifies 1 mil change in direction. (2) The elevating mechanism (fig 107). (a) Consists of an upper and lower elevating screw, and is connected to the gun by inserting the quick release pin assembly through the holes in the upper elevating screw yoke and the rear mounting lugs of the receiver. A scale, graduated in mils, is fitted to the upper screw to indicate elevation. This scale is marked to show 250 mils in depression and 100 mils in elevation from the zero setting. Figure 106. Tripod mount, MS.
(b) The elevating handwheel is graduated in 1-mil increments up to 50 mils, and is fastened to the elevating screw by a screw lock. This synchronizes the handwheel graduations with those on the upper elevating screw. A spring actuated index device produces a clicking sound when the handwheel is turned. Each click equals 1 mil change in elevation. The handwheel is turned clockwise to depress the barrel and counterclockwise to elevate. c. Pintle. The gun is connected to the tripod mount, M3, by a pintle. This pintle is semipermanently attached to the machinegun by a pintle bolt through the front mounting hole in the receiver. 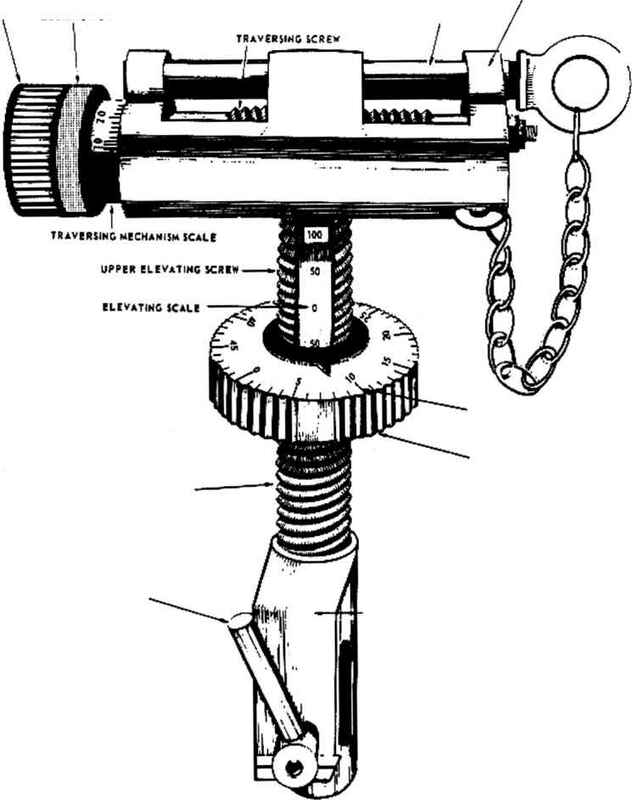 The tapered stem of the pintle seats in the tripod head, and is held secure by a pintle lock and spring. To release the pintle, raise the pintle lock, releasing the cam. d. General data. The weight of the pintle and traversing and elevating mechanism are considered as part of the total weight of the tripod mount, M3 (44 lbs). a. This mount consists of a cradle with a roller carriage on a circular track. The cradle can be rotated in the pintle sleeve of the carriage and can be adjusted for elevation. The carriage is guided on the track by rollers. The track is secured to the vehicle by supports.